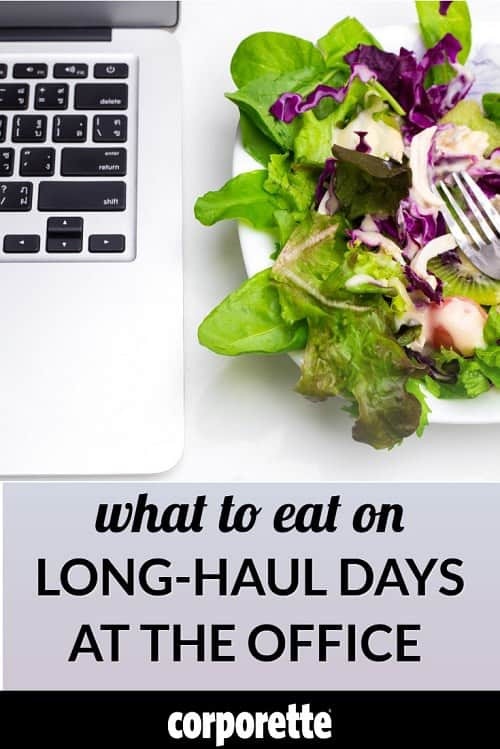 2018 Update: We still stand by this discussion of what to eat for long-haul days at the office — but you may also want to check out some of our more recent discussions, such as on the best energy foods to help you work all day, eating late at the office, or 40+ snack ideas for work! We smiled when we got this reader mail because, well, it’s a subject near and dear to our hearts: what to eat for long-haul days at the office. lunch – could be anything, but popular choices include: a Subway sandwich, a sandwich I brought from home, maybe a toasted bagel with cream cheese, a spinach salad with feta and cheese (or lately I’ve been liking spinach, shrimp, alfalfa sprouts, tomatoes, carrots, balsamic vinegar, and Saltines crumbled up in the salad — try it!) to some soup from the place downstairs with maybe half a piece of the whole-wheat bread. Oh — my afternoon caffeine hit is always Diet Coke with lunch — I’ll start drinking Bottle #2 once I’m done with that. afternoon snack – ranges pretty widely, from a decaf skim latte, to some oatmeal or other breakfast-type choices, to a 100 Calorie VitaTop , to some nuts, to candy or chips. (Regarding candy or chips as a snack — for me it seems to make me more hungry, more quickly, and so I try to only eat it if I know that I plan to order dinner fairly soon. But: hey, you know what they say about best laid plans…) Oh, and occasionally I’ll have a jar of peanut butter on hand and just eat a spoonful or so. dinner — here, it really depends how long a haul I think I’m in for, and who’s paying for the dinner (at my old job we were allowed to bill a client for dinner from Seamless Web if we stayed past 8:00 — at least up to a certain amount.) So if it was 6:00 and I thought I’d be working until midnight, I tended to order foods that didn’t have to be eaten all at once. For example, if possible, it’s great to eat fruit BEFORE you eat your dinner — it seems to give a burst of energy and, by the time your sugar levels spike and you’re starving, it’s time for the main meal. Or ordering soup (to eat first) and a half a sandwich (to eat in 2 hours). Other frequent dinner items at the office included things like omelets, grilled salmon or other fish, sushi, Chinese food (I like to order chicken or shrimp with broccoli, steamed, and black bean sauce on the side). Sometimes I’d order frozen yogurt and fruit for dinner, sometimes grilled, lean steak. I also liked cooked veggies like spinach, bok choy, green beans, broccoli, and whatever strikes me as interesting that day. If I hadn’t had a salad for lunch I’d often eat a salad for dinner. final snack: On the days I intended to be there until midnight and really needed to crunch, I’d mix a cup of regular and decaf coffee and drink that around 10:30 or 11 — because I’d do it only occasionally, the effect would be to spike my energy levels SUPER high, and then I’d completely crash about an hour and a half later– just in time for bed. (My personal rule was that I tried not to work past midnight unless I really had to — I found my work product was better, and my energy levels the next day better, if I left at midnight and got up at 4:00 or so the next morning to finish whatever it was.) If I was hungry again I would maybe eat the same kind of snack I would have in the afternoon, also. So that would be my “long haul” day — oh, and I’d estimate the cost to me would be less than $10 for everything so long as the dinner could be billed to the client. What does your long-haul day look like, readers? What do you do if you CAN’T bill a portion of the day to your client? That’s a lot of food. Maybe the author has a high metabolism like I do. I go through a high volume of food every day ; and this is necessary for me to not get dizzy/fainting spells. At my current workplace everyone knows this, so I’ve stopped getting strange looks when I bring a large sack of food to work every day. I actually thought it WASN’T much food! Ha! I’m thinking, “That poor Kat eats like a bird!” If I workout in the morning, I need to eat a) pre-workout food (peanut butter on toast and milk), and 3) postworkout food: 3 egg white omlet with cheese bacon crumbled in it and toast and orange juice! Lawgirl: I thought the same thing — it doesn’t seem like it would be enough for me, and I don’t have fast metabolism. I can’t eat pre-workout or for a while after, so my first food is usually oatmeal (Golean honey & Cinnamon is my current favorite) at my desk later in the morning. I usually have leftovers for lunch, along with fruit, and then home-cooked dinner (with wine most nights) is waiting for me when I get home. (Yeah, I’m spoiled in that way.) If I’m working really late, I’ll have a whole sandwich AND a big salad. Diet soda can also make you gain weight as many studies have shown that it actually (ironically) increases your appetite (not to mention that people tend to make up the calories for psychological reasons and that’s its just super processed & bad for you). Agree with AIMS (can’t reply directly to her for some reason). I never understand how people drink soda, let alone diet soda. It’s like smoking — people should know the detriments. Diet soda is nothing but fizzy chemicals that your body has a hard time digesting and causes bloat, among other health detriments. Whereas juices contain lots of sugar and many ppl don’t drink them for that reason, at least the underlying ingredients are fruits, which confer some nutritional benefit (make sure to drink juices that do not have added sugar — in that case you are getting natural sugars from the fruit themselves). On the other hand, ALL soda is detrimental to your health and anyone conscious of what they put into their bodies would be wise to quit soda cold turkey. That’s a large VARIETY of food–the actual AMOUNT seems very normal. In other words, exactly what we should all strive for–a large variety of healthy food while not overeating. Yay, I was just thinking I hadn’t gotten my daily dose food shaming and policing today! Thank you, m! I think it SOUNDS like a lot of food because Kat gives several ideas in each section. She doesn’t eat all those things in one day, obviously. i don’t believe this is representative of a normal day, but a 16 hour long haul. you eat a lot when you’re burning the midnight. Total food cost: $12-15 depending on where the latte and sandwich come from. Starbucks has a GREAT protein option that has a small bagel w/peanut butter, a boiled egg & fruit. Their panini aren’t bad either. Breakfast: For some reason I can’t eat carbs for breakfast and feel full, even if it’s cereal with a lot of protein in it. Me neither; it’s a pain because that’s so often what’s available if you’re out and about. I’m a fan of leftovers for breakfast. I usually eat a soft boiled egg for breakfast — pure protein, tastes yummy, great for energy, etc. It also super quick — it usually takes the same time to cook (with no supervision) as it takes my coffee to be ready (french press — grind beans, pour hot water, let stand for 2-3 min). If I need to eat more that morning, I add either a honey wheat english muffin or a banana (obviously for the no carbs in the morning folks, the english muffin wouldnt work, but bananas or other fruit is nice and easy). I think people eat too many carbs in general (myself included), so while I could probably be happy eating bread & cheese for the rest of my life, I try to limit carbs whenever possible (otherwise it turns into a toast for breakfast, sandwich for lunch & noodles for dinner). Indeed – absent the inner voice telling me it’s not ideal, my diet would rotate between bread, potatoes and pasta, all served with cheese. Oh, and fruit afterwards, oddly. I love fruit. i love the protein snack from starbucks too! i’ll have the fruit and cheese and egg for my midmorning snack and the mini bagel with peanut butter for my midafternoon snack (or vice versa). I love coffee (sigh) I spend $5-$10 a day at DD. Breakfast: Caramel Latte w/ skim from DD on my way to work, nothing before I leave the house I barely get out as it is. Then sometimes yogurt w/ fruit and granola (trying to bring from home because they are expensive out) and generally a bagel or sandwich from DD along with my 2nd coffee (try for regular coffee not a latte). Lunch: Usually some frozen meal healthy choice, lean cuisine etc., occassionally leftovers if I have them. I usually drink just water with lunch. Dinner: I am looking foward to dinner again! Been going to law school at night, so I rarely eat at home, maybe 2 nights a week. I have 2 nights I’m at school until 10:30 so I’ll usually get a Panera Bread or Subway (and another coffee) on the way to school. Then a tea and small snack to make it through 4 hrs of class. The nights I have school to 8:30 I’ll just grab a coffee or a tea at school, and eat either leftovers or sometimes nothing if I am too tired. Last night was my last class so I am really looking foward to going home and cooking! And no 3rd coffee LOL (at least until September). Snack – cake, popcorn, pretzels or fruit cup. Dinner – whatever my hubs microwaves. I’ll readily admit that I’m 15 lbs over my ideal BMI, but this works for me. I am very interested in the responses. I work at home, so I am able to be pretty flexible with regards to what I eat during work-hours. The challenge comes when I am traveling, especially on a day trip. I will often fly from Austin to Nashville for the day. This will typically be an 18-20 hour day, including 5-7 hours of flight/airport time and 8-10 hours of working time. I have to keep my energy up for all of it and so I have come up with a few strategies. I also eat several smaller meals. I drink a ton of water. I start the day with coffee,have water with Emergen-C throughout the morning, diet coke at lunch, more Emergen-C in the afternoon. Emergen-C is the best! I love that you include it in your “daily intake” summary. I substitute it for orange juice in the morning. I’m not a big fan of Soyjoy. I tried it right before the bar exam when I couldn’t keep more than a few bites down because of nerves. Out of all the energy bars I tried, it was the worst. Have to agree — my sister is a Soyjoy bar fiend, but I’m not a fan — to be fair I don’t really like any energy bars. I think they are so good! they taste like fig newtons to me. But like everything, it’s all about personal taste right? :) My husband hates them. I LOVE Odwalla bars and shakes — they are the best. You won’t be able to look at soyjoy cardboard after you try those. I LOVE Luna bars…that’s my usual breakfast with coffee and then I have a cottage cheese or greek yogurt and fruit mid morning. Clif bars tend to be my go-to if I need a quick breakfast (or if I’m not going to have time for lunch). I always try to keep a few tucked away in my desk. breakfast – (i) kashi cereal with soy milk, somtimes with a banana; (ii) ezekial english muffin with organic butter & jam; or (iii) yogurt & fruit. and always coffee. always coffee. lunch – pretty much eat out every day. so bad. but, i try to keep it to soup, salad, sandwich in some combination. dinner – protein & veggies. sometimes pasta cause it’s easy. I rarely snack. when i do, it’s pretzels & peanut butter or banana & peanut butter or the occasional OMG-Sally-brought-in-the-BEST-brownies-you-have-to-have-one mishap. My only energy issues are when I have eaten too much for lunch. i try to stay away from caffeine after about 2pm otherwise, i won’t sleep. Seems to work for me! Meals start out big and get increasingly smaller. I eat less overall when I snack all day. I have a little mini-fridge in my office and keep fat-free organic yogurt in there – like Stonyfield Farms, Chobani, Walla Walla. (Just tried Redwood Farms goat milk yogurt today – low fat, didn’t have fat free – and it is really good). Also, bags of baby carrots and a Kashi frozen dinner or two for when I want a bigger lunch. And Nature’s Path instant oatmeal – can just add hot water in a coffee cup. Best discovery this year – how good dried cherries and almonds are as a snack. I usually will throw about 15 of each into a ziplock in the morning. Also, blueberries and either grapes or strawberries (great for tossing in the yogurt or oatmeal). I try to keep an apple/orange/banana on hand for when I start to get hungry in the afternoon. For dinner, if I am not at a restaurant, I will usually order in (usually either Vietnamese, veggie pizza on wheat crust, or rotisserie chicken/veggies) or make something quick like scrambled eggs on a toasted wheat english muffin with a salad (toss some blueberries/strawberries on top, with a pinch of sesame seeds and dash of either red wine vinegar and olive oil or Trader Joe’s shiitake mushroom sesame dressing). Have been accused of eating like a raccoon due to all the nuts and berries, but it works for me! If you have a Trader Joe’s near you, they have a trail mix that is almonds, cashews and dried cranberries – the nuts end up taking on some of the cranberry flavor and it is dee-lish. It’s a great mid-afternoon energy booster. Traders Joe’s chicken tikka masala is one of the best frozen meals available (trust me I’ve tried most of them). Toaster. Start frozen, run it twice, turn the naan over for the second time. The naan is lovely with butter, but the TJ’s pesto-in-a-jar is good too, and has more nutritional virtue. NB: check teeth afterwards! They have a new one, well, I’ve never noticed it before. Not frozen, but it would do ok in the fridge for a couple of days. Mushroom tortellini with spinach and asparagus. Very, very good. Sounds delicious, I’ll have to check it out. Is it single serving? I hate how TJ’s likes to put two servings in a frozen meal box, like anybody would save half of a frozen meal for later. Guess it might not be as annoying with non-frozen food though. I have a husband and two kids, and cook a lot – we have been making efforts to eliminate processed/prepared foods from our lives, which makes for a messy kitchen most of the time. Breakfast: Steel-cut oatmeal with berries and walnuts, coffee w/2% milk. Lunch: Leftover beans & rice with green salad, strawberries. Dinner (DH is cooking tonight): Whole-wheat pasta w/marinara sauce and salad. Tonight is TV night :-) so I will likely have some popcorn. Ditto on eating whole foods. I used to get sick often when I ate tons of frozen foods (in law school, when I just had no time). I’ve started cooking a lot in the last two years and have noticed a big difference in my health and energy levels. My go-to healthy snack: really good old white cheddar cheese with a tart apple, MacIntosh or Braeburn, mmm. Me too! Our kitchen is a disaster area on Sunday’s when I do all of the cooking for the week (there’s just two of us, my fiance and myself, and we both are out of the house from 7 a.m. to 9 p.m. most days) so that we don’t have to eat out at all. If I am working late, I eat dinner earlier but I order take out from a “real” restaurant to maximize the quality of the food. Groceries for 2 people with this diet are about $150 per week, but eating out costs are under $10 (for lattes). Ditto on not being able to stay full after eating carbs for breakfast! I am always hungry within an hour of eating cereal. Breakfast – greek yogurt with honey, ground flaxseeds, frest fruit and chopped walnuts with a cup of coffee. I make time to make this every morning because it is the only thing that gets me through the day. Lunch – if I don’t bring lunch, I usually get too busy to step out for lunch and end up skipping it altogether. So, I try to bring leftovers or a sandwich. Snack – I am terrible about stocking up on snacks. Where do you all store your snacks in your office and how often do you need to replenish? I generally don’t snack, but if I’m desperate, I’ll get sun chips or animal crackers from the vending machine. Dinner – If I plan to leave the office by 9:00 pm, I always hold out for the amazing home-cooked meals my husband whips up every night. He is a life-saver! I have a desk drawer that I keep a box of Kashi cereal, a few bags of roasted almonds, and whatever other snacks I’m into — BUT – I don’t keep a lot, because proximity to snacks = greater likelihood of excessive snacking/binging on them… so if there’s a limited quantity than there’s a limit to the damages! I’m a fan of Gladware for bringing things in since it’s washable and reusable but if it accidentally gets tossed its ok. I get a box of granola bars, what have you from the grocery store probably once a month and bring it to the office. Bring in fruit daily and a stash of yogurt weekly when it’s available at home. I have a mini-fridge and a desk drawer dedicated to personal items like food and my emergency stuff (nail clippers, deoderant, band-aids, tampons, mascara etc..). My fridge usually has some iced tea, apples, mini-brie cheese wedges, baby carrots, and my water bottle. My food drawer has crackers, granola bars, trail mix and hard candy. I also usually keep one or two full meals (microwavable soups or the Healthy Choice/Marie Calendar steamer entrees) in case I wind up staying so late that a snack isn’t going to cut it. I just refresh things as needed – usually one or two things will need to be replaced each week. I also have a “decoy” box of stale crackers on my bookshelf so my nosy co-worker neighbors at the office late at night will grab that instead of my good stash of food in my drawer! On an unrelated note, I gave up soda for Lent and, despite my deep and profound love for Diet Coke, have kept up with it since then. After that didn’t kill me, I also seriously reduced my caffeine intake to about a half cup of coffee a day. I think that lower caffeine, plus more variety in my eating habits, has really bumped up my energy levels during the day. This is actually how I cut out soda from my diet entirely as well. I used to have a soda habit but began giving it up for Lent. I drank carbonated water instead. After about two-three cycles of Lent, I couldn’t give it up anymore as I wasn’t drinking enough. After a few months without, you really don’t miss it. In fact, now I almost can’t stand to drink soda of any kind any more- it’s just too sweet and not appealing at all. I also keep a stash of snacks in my desk drawer. regular things include smoked almonds, gold fish, reduced fat triscuits, kashi ceral and Luna bars. I stash a few greek yogurts (chobanni brand) in the fridge or things like lower fat string cheese (Trader Joes is the best!). And then I bring a few peices of fruit for the day…if I don’t get to eat them, I keep ’em on my desk for another day. A general pattern I am seeing is one that I also follow–eat several small meals a day. Eating protein-packed meals every 2-3 hours keeps blood sugar high and gives fuel. Works great for both energy, health and weight loss. lunch: I’m been trying to lose a few for a friends wedding so I’ve been sticking to fat free yogurt and some sort of snack (either fruit or a 100-cal pack of something). 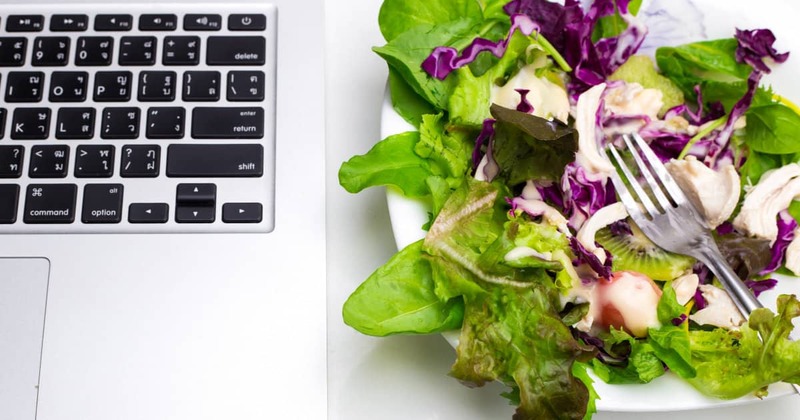 Usually, though, it’s an overpriced salad from a place around my office (with cheese and chicken and dressing), soup, or occasionally sandwiches (deli-made sandwiches tend to be just hiding calories everywhere, from the thick bread to huge meat and cheese portions – so I try to avoid them). Dinner: Lean cuisine or, if I have it together that week, I’ll make like a veggie baked ziti or something with whole wheat pasta and have a portion of that each night. Best thing I’ve ever found: I have such a sweet tooth, and I just love chocolate. Sometimes I really just want that flavor. Godiva makes chocolate “pearls” – small, raisin sized droplets of chocolate with different flavors (plain, dark, dark with orange, mint, etc.). All I really need is two or three to get my chocolate fix and there are only 25 calories in EIGHT pieces! Oh, good tip on the Godiva chocolates! I will have to try those. It is hard to get the chocolate fix without overdoing it. They sound lovely, for those with more self-control than I have. I can’t have sweets in the house. I go to Albertsons for regular grocery shopping because I don’t like their baking at all. Another option, if you don’t like the taste of black tea is Moroccan mint green tea. For me, green tea doesn’t sit well with me but I want the caffeine and this combination works perfectly. The one I buy is choice organics, but I know you can find it at bulk tea shops as well. I just checked out the website for lunchskins. Such a great idea! I will buy a few today! Breakfast: smoothie with berries, banana, frozen mango, protein powder, 1 percent milk, yogurt or kefir and green tea powder. On days I don’t have time to make this I usually grab a piece of string cheese and a packet of peanuts and eat them in the car. I don’t snack mid-morning. I do start drinking water as early as possible and refill throughout the day. Lunch: cheese (full-fat – I would rather eat the real stuff and eat less of it) with turkey or ham, celery with a small amount of PB or light whipped cream cheese. Sometimes a few wheat crackers. Usually some kind of fruit (grapes, pear, apple, etc.). I also always have a small square of dark chocolate at the end of lunch. I bring everything for the week on Monday and store it in our office refrigerator, and take home everything I haven’t eaten at the end of the week. Mid-afternoon – I save my coffee drinking for the afternoon and I load it with milk and Splenda. I usually have something small with my coffee – nuts, a hundred-calorie pack of something, or a small yogurt. Second afternoon snack – I usually filch a little of whatever my son is having as his after-school snack, which is usually trail mix with dried fruit, wheat crackers and cheese, or air-popped popcorn. I should feel guiltier about it than I do. Dinner – whatever I decide to cook. My husband can fix a broken computer, toilet or air conditioner no problem, but is not much in the kitchen. He is a big meat guy and also very into the whole protein-starch-vegetable dinner plate idea, so very often we have grilled whatever (chicken, steak, salmon), some sort of steamed vegetable, and rice pilaf or egg noodles on the side. I make spaghetti once a week because my son loves it. I like cooking and sometimes get inspired – for example, tonight we’re having seared lamb chops with goat cheese polenta and sauteed spinach and mushrooms. Dessert – after I put my son to bed I have a little more dark chocolate or a cup of cocoa (or tea with milk and sugar), usually while I am catching up on email. I do much better on a higher-protein, higher-fat, lower-carb eating plan, energy-wise, weight-wise, etc. It keeps my blood sugar level throughout the day and makes me feel satisfied without making me feel sluggish. I agree too. I just started eating 2% yogurt and like it so much better than fat free. I haven’t got the nerve to start eating full fat yogurt but I will. It keeps me full and I haven’t noticed any difference in my weight either. Most fat free stuff is full of junk, sugar, aspartame – yuck. I definitely concur on the full fat cheese. I try to eat the same thing almost everyday. I know it gets boring, but I try to bring all of my food from home so that I save money and don’t eat a bunch of extra calories. This assumes that I have been to the grocery store in the last week or so for produce. If I haven’t been, all bets are off. This isn’t a ton of food, but I’m on the small side, and it’s enough to keep my energy up all day long. Not one to harp, but I think we’ve deviated from the topic of what you do on your insane days, not just your everyday. Breakfast, always. Usually involving eggs (good for the mind). Goji berries (dried, no sugar) through out the day, whenever I just need “something” — miraculous (mind & energy). For variety, I sometimes throw them in my tea & scoop out with a spoon later. Sushi — either lunch or dinner. Or a salmon fillet. Maybe it’s all in my head, but it helps me think better & stay up longer. Especially if I just get a salmon fillet w/veggies. Other randoms: green teas (lots), irish breakfast tea (lots — this is if I dont want to drink coffee but need to wake up), coffee (obviously), emergenc-c — a godsend, esp. the day after. I forget to take my vitamins usually, but I do try to take this stuff called perfect food on really hectic days. It seems to help. After I’m done, if I cannot fall asleep/unwind, I will drink sleepytime tea. I double the teabags & it makes me feel all sorts of better. Walnuts, roughly chopped, mixed with a jar of good, organic honey. He would drink green tea and eat a couple of spoonfulls whenever he felt sluggish. It perked him right up, but without any crashing feeling after. not so — by law residents can’t be “on call” or work longer than 30 hours at a time and for more than 80 hours in a week (they changed the law right after my husband graduated residency – he was only slightly bitter). Those thirty hours include “on call” time and they often catch a few hours of sleep while on call. I don’t know about you guys, but I have worked far longer than that at a time when doing trial prep, trial, post trial, something the partner needs “right now” . . . ok, I may be a bit bitter about this! ha. My cousin works abroad, did his residency abroad, too. No such laws. They work straight through — though he did admit they get to take naps by taking shifts (and thank god — I would not want someone who did not sleep for 40 hrs tending to me in the Emergency Room). 80 hours may be the technical “law,” but it certainly isn’t followed… at least in some places. My boyfriend is a surgery resident and says that all of the residents at his hospital log only 80 hours per week for fear of backlash by hospital administration/putting their program in jeopardy, although they work far more. His friends from other hospitals concur. Tell your husband that, as of now, things haven’t changed much. 1) mini meals — the old adage in surgery is to eat when you can, but the trick is to not eat a huge meal. I’m a big fan of fage greek yogurt (especially cherry and honey); also hummus with carrots, a carton of soup (hospital makes yummy homemade soups) a piece of toast with pb. Protein is key, and a little bit of healthy fat. I try to minimize carbs, but I do love them so. Anything I can eat while standing up or walking is key. 2) no coffee after 8pm. I switch to black tea which gives me a little lift but none of the nausea I get with overnight coffee. 3) Lots of water. I guzzle it, often going through 4L in 24 hours, though I think I sweat a lot of it out. Also, it ends up in my ankles, only to be diuresed on my post call day. 5) I am a huge fan of Trader Joe’s. I personally like the Paneer Tikka Masala better than the chicken. I also mix their tart montmorency cherries with their 1/2 salted almonds as my favorite snack. Traveling is such a killer – I take the fruit from the hotel front desk and pack baggies of crackers, but usually lose on dinners out! For long days at the office (and for that matter, most every day at the office), what helps me is eating whole foods — steel cut oatmeal, eggs, greek yogurt for a snack, fruit, etc. I also HIGHLY recommend eating beans or lentils for lunch — it fills you up, is full of fiber, and satiates your hunger through the long afternoon (when it is so common to eat bad snacks). I also drink decaf green tea in the afternoon, I find that it keeps me awake but not jumpy. Oh, and in terms of how much I would spend per day on food — I would say about $5 a day, sometimes more sometimes less. I usually always bring my lunch and cook for dinner so that’s why it’s so cheap! There are some great snack/small meal ideas in here! I work for the government so don’t have these long insane days that many of you do, but my BF works full time plus goes to school two to three nights a week and so on those nights we don’t eat dinner until he gets home around 10 PM. I’m always looking for healthy ideas to keep me from starving between lunch and dinner! It’s not terribly on-topic here, but I’d also love to hear about how people fit in exercise on those hectic days – BF and I would both like to continue losing some weight, but his school schedule doesn’t really leave him much time to do anything active (I go to the gym after work on his school nights, but not as often as I ought to). On hectic days, I find that stress alone is enough to keep slim for me. But even so, I think it’s less about finding an hour to exercise, and more about just constantly making active choices: e.g., taking the stairs up & down, putting things away & getting them, walking to get food as opposed to ordering in, walking to a further subway stop or getting off early, etc. It’s not hard to do if you live//work in an urban environment (i’m in ny), it’s just a matter of making active choices a habit. If you live somewhere where driving is a must, I suppose you could park further away, etc. . . Also, if you live in a house w/stairs (make a point to put lots of little things away all the time thereby taking the stairs up & down & generally moving & that sort of thing. I think we’ve gotten so inactive as a society; we go to the gym but we’re incredibly inert the rest of the time — it’s almost comical but also completely illogical. Sounds like my fiancee and my schedule…we are both in school and work full time, so we are only home together 1 night per week and then weekends. We both work out at lunch, and we both have taken up running. While it’s not my favorite thing (I’d rather spend several nights a week in yoga classes), it’s efficient and a great cardiovascular workout, calorie burner and bone strengthener. I work in a downtown area, and i walk several miles a day by default. I am sure if helps to some extent, but I don’t count on my walking commute to help me with weightloss by any means. He and I try to hitthe gym together on weekends for weights and more cardio, and as it’s warming up we try to go for walks together to get in some more activity. After reading this, I have to threadjack just to comment that I am so, so glad that I no longer work in a law firm. On my long, long days, I might have to eat lunch at my desk and pick up a salad for dinner on my way home at 7:30. The horror! i want your job!! is it govtt or inhouse or something? I guess my hours in the past may not have been as crazy, but even with odd (and sometimes long) hours, I’ve managed to keep fairly ‘traditional’ eating habits that don’t really rely on pre-packaged/fast/convenience food. The secret to this is meal planning. Yes, slightly-OCD-plan-everything-you-will-eat-for-the-week-on-Sunday meal planning. And it keeps me pretty regular, even on the crazy days, therefore my eating schedule/habits remain fairly regular despite strange hours. Lunch: I bring a lunch every day. If I am going out, I PLAN this into my schedule as best as possible because eating out spontaneously wastes the food I’ve brought/planned for. Plus, it’s expensive, and I refuse to pay $10-12 for a sandwich type lunch I could easily make at home. Anyway, lunch is usually a simple sandwich, another piece of fruit or fruit cup, granola bar sort of thing, maybe some carrots/celery/cherry tomatos, and then probably some cracker like thing of sorts (wheat thins or triscuits or something). Or, sometimes I bring a tupperware container of leftovers from the meal-planned meal the night before. Dinner: On busy days where dinner is at the office, again I plan this into my schedule. Usually I’ll eat the tupperware meal for lunch (because I can have access to a microwave to heat it up), and I’ll bring a separate sandwich/fruit/veggie/granola bar set for dinner to eat wherever it is I end up eating (office, metro, bathroom before meeting, etc). The tupperware meal on these days then is generally something amenable to being leftovers, such as pasta/pasta casserole, meat and rice with some sort of sauce, chunky stew/chili, etc. These are all things I cook at home, either in smaller portions (I’d make enough chicken+sauce for that meal’s portion plus maybe 2 extra) or in large quantities (such as a lasagna that I can freeze portions of and have for a long while). On a normal non busy day, I cook everything at home from my meal plan. I buy what I need at the start of the week and stick to it. I also try to organize and coordinate ingredients to keep cost and waste down, so that sometimes means making dishes that are similar in theme/style for a few days so I am not running out and buying a whole big portion of something (say, tortillas) just for a singular meal. Occasionally Friday and or Saturday nights, fiancé and I will maybe eat out, but often we cook then too. I rarely eat out during the week unless absolutely forced to or planned into my schedule, in which case I buy fewer groceries and plan for one less meal. Sundays are usually the day of mass cooking to have things to use during the week without a lot of hassle. Yes, it might seem easier to just grab convenience food, but I prefer it this way- I like cooking and I save a lot of money (and calories) by doing things myself. Plus, planning eliminates the excessive time-factor and heating up a piece of frozen lasagna I’ve cooked myself is just as easy as eating up a Stoffer’s box. If I’m careful/buying things on special/have a lot of ingredients for the week already, my grocery bill is about $30-40. A high week where I am buying bulk staples (ex, olive oil)/condiments/pricier specialty ingredients may be more like $80, but that’s usually rare. And, like I said, since I plan for when I am eating out, I don’t buy groceries for that meal and thus eating out is not quite as expensive (and I don’t lose that much money) because I don’t have food/another meal sitting at home wasting. It works for me. I don’t eat any differently on hectic days than on less hectic days, I’m a little surprised so many people seem to. The one thing I do daily that helps keep me going in general is drinking green tea throughout the day. I used to front-load with lots of coffee in the morning and then maybe a diet coke in the afternoon, which lead to crashes. Now I have one cup of coffee first thing in the morning and then switch to a small but consistent supply of green tea until dinner. I have more energy and generally feel better all around just with that one small change. I don’t eat differently on my busy days as opposed to my normal days either. If anything, maybe I’ll throw in another snack or two but that’s about it. I know this should be about hectic days, but I usually never know when my “long-haul” days will be. I’m in law, so every day tends to have some “emergency” when a partner needs something ten minutes ago — yet it takes 10 hours to prepare! lovely. Breakfast – 2% greek yogurt, granola and fruit. coffee. Begin my 2 liters a day of water (bring a 1l bottle and refill around 2pm). Lunch – usually grab soup from downstairs and eat with laughing cow cheese/cubed cheddar/babybell cheese and crackers. sometimes I grab a salad and add a little olive oil (keep in desk – odd, I know) and some dried berries. water or iced tea. mid-afternoon – assorted nuts and berries. more coffee. refill water. 6pm-ish – if I think I will get to leave by 8.30 or so, I’ll snack on more fruit and nuts and maybe some peanut butter and sometimes (shamed face) chocolate. that way I can eat dinner with hot husband. dinner – whatever looks good at the take-out counter. or husband grills a lot and we love veggies. I don’t get enough veggies, but I pack them on for dinner. If I eat at the office, I get a salad. I try to never eat fat-free things or lean cuisine type stuff. I just never feel full and often feel cheated. and this is tmi, but I am sick of pee-ing 12 times a day!!! I need tons of water, but I am constantly getting up for the bathroom! ugh. I’m with you on the last point. I think everyone at my office thinks I’m pregnant because I drink about 80 ounces of water during the work day (8-6) and am constantly in the bathroom. yes I agree – though by now they’ve probably figured out I’m not actually pregnant, just weirdly small-bladdered or something. I am a little selfconscious of it but need to drink a lot of water! ha ha – I’ve actually had those remarks! ugh. Breakfast: Homemade Smoothie w/ strawberries, blueberries, bananas, nonfat yogurt, and a small splash of orange juice. Am thinking about adding in a piece of toast. Dinner: Varies widely, but usually includes a salad. I’m a vegetarian, so instead of just calling a piece of chicken dinner we do some creative meals. Usually have vanilla yogurt with strawberries for dessert (yes, I am on a major fruit and yogurt kick). However, I’m thinking about reconfiguring my meals to be more like a previous comments–a big breakfast, medium lunch, and small dinner. I just realized my comment about having chicken for dinner sounded snarky. That wasn’t the intent. I only meant to say that since I am a vegetarian in a meat focused society, I am forced to get creative when I’m short on time but don’t want to eat salads and pasta exclusively :). I think front-loading my eating has helped with weight control. Just have to be careful not to blow it at the end of the day. I’m vegetarian too but with zero cooking ability or desire, so I understand the difficulty in figuring out how to make a meal without basing it on meat! Another vegetarian here, I know what you mean! I recently started documenting what I eat because I found that I wasn’t eating enough. Now that I blog about it, I take the time to prepare food or think about what I’m ordering. Also, if there’s no entry for the day that means that I didn’t have a real meal which leads others to bug me and remind me to eat. Sad that work can be so stressful it stops you from eating! I include recipes too. whooops link was wrong fixed it now click on my name to view! As “the client,” let me say that I am not keen on the idea of buying you dinner because you worked late, unless you are on trial, or for some reason it is at my demand that you are working around the clock. My red pen will be crossing those entries off the bill. I worked at a firm for a dozen years before I went in-house, so of course I understand there are late nights, but my firm considered it an investment in making us bill a lot of hours if it (the firm) bought us dinner on days we billed ten-plus hours. Yes, I know those costs get passed onto the client in one form or another, but I just had to pipe up and say billing meals to “the client” might not go over so well! fair enough. but remember — I was at a Wall Street firm that billed even first years out at $360/hr at the time — so the little $30 I was allowed to spend on dinner was but a blip on the radar. We would just enter the client/matter code when we checked out on Seamless — no idea how that looked on the bill on the other side. I’ve heard times have changed in the year or so since I left firm life, though, at least for the moment. Anything rather than Redbull, that stuff’s just evil. Breakfast: My husband makes me a smoothie, usually various berries, banana, peaches, soy milk, grape or pomegranate juice, protein powder. He changes the fruit he uses sometimes, so I don’t always keep track. When I feel hungry, I just grab a section from the lunch box and eat what I put in there. It’s typically a good portion to make me feel not hungry. I usually bring some raw nuts (usually I bring mixed raw nuts, but sometimes I ‘ll bring just one type of nut), half an avocado, some fruit, and carrot sticks with hummus. Occasionally I’ll bring a little bit of cheese when I want a treat. I mix up the fruit, but usually I otherwise bring basically the same thing every day. I’m a creature of habit during my work day, so this usually works well for me. I don’t drink anything during my work day other than water. For dinner, I eat whatever my husband cooks for me (usually meat and vegetables, often served with bread), probably with a glass of wine or a beer. Sometimes I eat a cookie or two after dinner. can I borrow your husband please? He IS fabulous. I wish I could clone him for everyone. These lunchboxes are the best! I cook up a ton of different meal options on Sundays and fill them for myself and my boyfriend throughout the week – keeps us both from spending unnecessary money on poor quality quick-food options. I’m surprised at how popular granola bars & energy bars are. I like Nature Valley Oat n Honey. They got me through the bar & I haven’t given up on them since. I wish I could say that my diet (even on my non long days) is as well balanced as most of the comments! One thing that I have started doing is saving the to-go soup containers from take out restaurants and filling them with leftovers that freeze well. I always have the containers on hand and when I make soup, chili, mac and cheese, or other foods that freeze well, I make too much and put the leftovers in the take out containers. I then pop the already portioned meals in the freezer. It takes the same amount of time as heating up a frozen meal but I get to eat something that is home cooked and way more cost effective. I do that too! It’s also great to take lunch to the office & then toss in recycling (as I hate washing tupperware in office as it never gets clean enough & I hate, HATE, taking dirty dishes back home in my bag). I have a mini-fridge in my office and on really crazy days I drink four or five “Sencha Shots” — essentially cold concentrated green tea in little cans by the Japanese tea company Ito En. See http://www.itoen.com/teashot/index.cfm. The Oolong Shot is also good. They give me a gentle steady lift with no jitters and no crashing. When I was pulling multiple all-nighters for an insane deal I would down one right before I had to walk into a meeting or get on a call. They are both pretty strong-tasting, by the way, so I would only recommend them if you already like the taste of unsweetened tea. They are expensive in delis here in NYC so I used to order them by the case. The shipping adds up but it’s still cheaper. I also have found them at a couple NYC supermarkets and have stocked up that way. Not a great diet, don’t really recommend, but it works for me, sort of! Surprisingly I’m not sick of cereal (yet)! I’m impressed by how healthy everyone is here. I also wish I had the self-control to do what some of you all do and bring in stuff ahead of time and store it in my office. It would save me a lot of money. But I know I’d just eat whatever’s there, and have a hard time stopping; plus I really crave a walk around the block once or twice a day, so that’s my excuse to go buy my next meal/snack. Also wanted to plug for Vitamin Zero. Fills me up, but not as tasteless as water, yes I know it’s fake-sugar-water with probably lots of evil cancer-causing stuff in it, but if it will help me keep weight off and tastes good then I don’t really care, I’ll drink it! Too bad it’s rather expensive though. It’s true. On my rough day, I dont think about anything calorie wise. I will have a croissant, usually. Also, will eat more than usual for lunch — because I need “extra fuel,” I reason. Trust me — people are usually much more sensible in their mind, than in reality. I feel like this thread has been a big wakeup call, I spend way too much eating out. I know what you mean. I still spend money on eating out, but I try and limit it to weekends or when I’m socializing with friends. If it’s just me or me and the hubby, I try to make it a point to bring food from home. Most of my lunch options aren’t that great anyway. Another Vitaimin Water Zero fan here…it actually doesn’t have artificial sweetners in it, it is sweetened with stevia, which is a plant/bush type thing. Thought the same thing as I fear artificial sweetners, but my sister informed me it was all natural, sure enough, it is! Has anyone ever tried those little Energy Shots?? I’ve seen them by the cash register and been tempted, but never actually tried one. I’m not afraid it’d be too much caffeine, that would be a great benefit actually, but I wonder whether they actually taste decent or if you just have to chug it, which dosen’t sound too enjoyable to me. They taste like melted gummi bears. Seriously. Tried the 5-hour energy taste like poprocks–not good. Seemed to work but I can never be sure if its actually working or just mental, i.e. : I drink it, expect the energy so mentally I feel energetic. But I will say that I get shakes from weird caffeine-chaged energy drinks and such and didn’t feel that way with the 5-hour energy. @E – I’ve had 2 donuts for breakfast (or better yet, an apple fritter), fries or chips for lunch, slice of kids’ pizza for dinner. Whoops, was that today?! LOL. crap – now I want pizza and fries! thanx a lot . . .
Breakfast – bagel with light cream cheese. cereal doesn’t work for me either – stomach will be loudly growling by noon. Lunch – 95% of the time i bring it – apple and cheese sandwich, avacado that I make into a salad or eat in a sandwich, curried lentils/beans with tofu/quinoa (TJ’s for the lentils/beans); leftovers; fettecine alfredo or lasagana lean cuisines (the only ones that taste good). Dinner – usually get to make it at home – some sort of pasta/grits/veg/egg/cheese concoction. if I have to grab something its usually cosi or a big bite at 7-11 (its cheap!). grocery bill is usually in the $30 range for the week. I try not to eat out during the week (besides my bagel) and then eat whatever during the weekends. Does anyone else who’s single find it really hard to feed themselves? I am a good cook, and have no problem hosting a dinner party for 8. I have so little motivation to cook for myself and I’m so drained at the end of the day the last thing I want is to make myself dinner plus lunch for the next day. Plus, if I try to buy healthy foods, I end up spending so much money on groceries it’s insane and then half the produce and fruit rots anyway. I eat way healthier if I just pick up food, and I eat less, too, if I don’t have food in my house to graze on when I get home at night or am home over the weekend. I think part of the problem is that I’m fairly introverted and feel really drained after a day spent at work with others, and don’t have the energy to cook or grocery shop, and also since I live alone, my social time with others often involves buying food or drink. And I spend so much money on food, it seems irresponsible. Anyone else have similar problems? I have this problem, too. Often I find it cheaper to eat out than cook at home. I don’t have any problem eating leftovers, but after the third day they start to get old. It doesn’t help that I seem to be incapable of cooking for fewer than six people. I also get most of my social interactions from going out for food or drink with other people, which makes it harder to plan meals. – Freezing a portion of whatever I make. Anytime I make a dish that would freeze well (mostly soups, although rice and beans seems to work) I portion out the amount that I’m going to be able to eat before I get sick of it, and put the rest in the freezer. If I were really organized I would try to get on a meal rotation using frozen meals, but I’m not. As it is, it’s really nice during busy weeks to be able to pull something homecooked out of the freezer. -Simple, healthy meals- I make a lot of omelets with frozen vegetables and cheese, I try to keep cooked wild rice around so that I’ll eat it when I’m hungry instead of junk, I’ve recently started making pasta casseroles with whatever I have left in the freezer and I really like them. – I have an aerogarden http://www.aerogrow.com/ that I use to get some fresh veggies. I’m currently growing lettuce, but I plan to try basil next. I learned how to cook for my whole family, so I have a hard time cooking for just one person, as well…it’s really hard to size stuff down and frankly even if I freeze it I’m not going to eat a whole pot of something by myself. The being exhausted/not home until late thing does not help. I’ve found it’s helpful to buy the salad in a bag (for a while I found a huge salad in a plastic box and that was AMAZING because it lasted me a whole week for dinner) and then if I’m cooking for my (not live in) BF on weekends I’ll just make a lot extra of something like grilled chicken and throw it on top of the salad over the week. I don’t have a bunch of rotting veggies in the fridge but can still have my not too boring salad. Salad in a plastic box is the best. I just put in chicken, parmesan cheese, and some anchovies or chicken and shake it up with caesar dressing. Meal in a box. I live on yogurt, apples and peanut butter. Maybe I should try Special K.